But as I played more, the tactical nature of “Evolve” surfaced. Something clicked in my brain, and I started to understand its complexities more and more with every match. After 10 hours, it changed from “generic shooter” to “strategic playground” – and it keeps getting better the more I play. 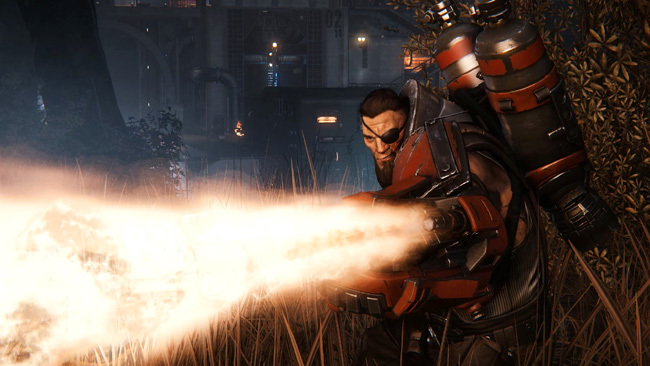 “Evolve” founds itself on a premise of imbalance that would fundamentally break any other multiplayer shooting game. One player takes the role of a monster while four others become hunters. The goal is simple enough in “Hunt,” which is the game’s core mode: the monster must eliminate the hunters or destroy a power relay and the hunters must kill the monster before it can do so. Whichever faction accomplishes their goal first wins. 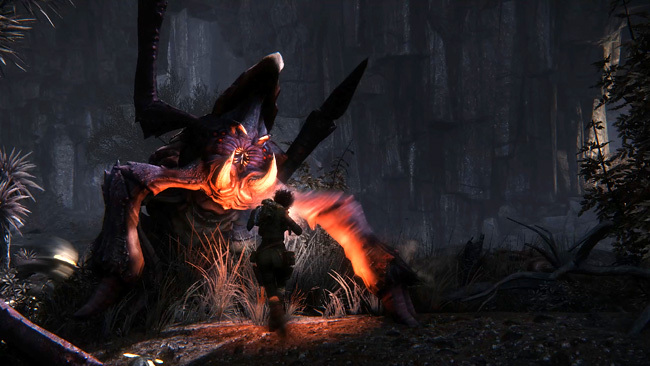 “Evolve” is available now on PlayStation 4, Xbox One and PC. What amazes me most about “Evolve” is how well it maintains balance amid structurally uneven gameplay. The monster begins at level one and must kill wildlife to gain armor and evolve to the next level. With each, it becomes significantly stronger and more powerful. Once it reaches stage three, it can destroy the power relay and becomes virtually unstoppable. The job of the hunters is to track it down in a large arena and hinder its progress or bring it down. I’ve played for about 20 hours now, and my rough estimate is that the monster wins 50% of the time. Despite relying on a 1v4 mechanic, it’s a fair and balanced system. This refreshing introduction to the otherwise stale shooter genre is a welcome addition to any multiplayer junkie’s library. 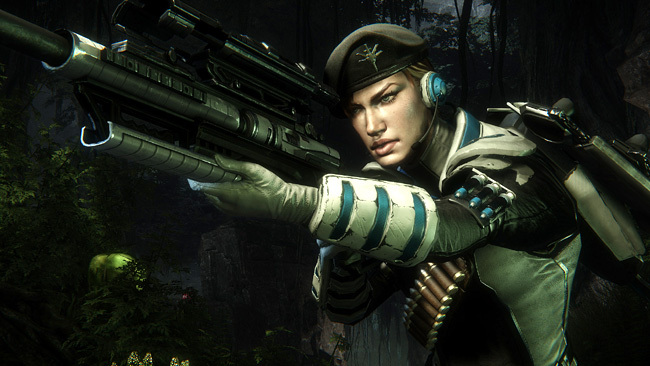 The four hunter classes – Assault, Support, Trapper, and Medic – work together seamlessly in battle. If you manage to get some smart players in your party, you can become unstoppable. Assault can fire on the monster with devastating weaponry; the Trapper can contain the monster and impede its movement; the Medic pierces the monster’s armor, creates weak spots and heals teammates; and Support can shield hunters and fire upon the monster with advanced weaponry. They’re made to blend into one monster-killing machine, and when they all work in conjunction, it’s intensely satisfying. I’d feel slightly remiss if I didn’t mention the “Defend,” “Nest,” and “Rescue” secondary game modes. They’re not quite up to the standard of “Hunt,” but they get the job done. It’s interesting to play them if only to figure out how the classes interact outside a search-and-destroy objective. Despite its exquisite balance, the full “Evolve” experience is locked behind a seemingly arbitrary progression system. Of the 12 total Hunters (three for each class) and three monsters, only five are available from the start. I unlocked a few new characters in my time with the game, and it finally started to feel well-rounded and complete. At first, though, it’s not quite as robust as an exclusively multiplayer game needs to be. On the other hand, this system allows you to master the available characters before moving on to new ones with different weapons and abilities, which speaks to the game’s malleability. No match is the same because players have different preferences and play styles. Still, I’m of the opinion that unlocking characters is an unnecessary hurdle when they so drastically change the game. If you disregard the unlockable character hindrance, “Evolve” has a strong narrative foundation even though it can only be seen in brief glimpses. The Hunters are on planet Shear to rid it of monsters, but their short personal interactions before each hunt are witty and fun. They build an entertaining team dynamic that kept me wanting more. In the absence of a single-player campaign, it’s pleasantly surprising to have deep lore and a beautifully imagined world. I quickly learned I was terrible at taking control of the monster (my matches as the beast were much shorter than as a Hunter), but I prefer the more traditional experience of destroying something much larger than myself against the odds. The cat-and-mouse gameplay was frustrating at first, but I grew to love the intense and gripping feeling of tracking the wretched creature. Anticipating its movements and unloading a full magazine into its weak points is a rush that can’t be found in many other gaming experiences. My advice to anyone who is unsure about “Evolve” – like I was at first – is to give it time. It’s a truly next-gen multiplayer accomplishment that won over even the worst FPS player. The chase can get boring and the fight a bit frustrating at times, but these tiny shortcomings can easily be overlooked. The game definitely earns its name as you play. It turns from a ho-hum shooter into an intensely gratifying tactical experience, and my guess is that it will age incredibly well. “Evolve” was reviewed on PlayStation 4. It is available now on PlayStation 4, Xbox One and PC. The game was released on Feb. 10, 2015. “Evolve” is rated “M” (Mature 17+) for blood, strong language and violence. Submitted by AlwaysGaming (not verified) on February 24, 2015 - 11:17pm. First of all, I love the Crush thing. If your name is really Cole Rush, that’s too good to be true for a gamer. Second, I can tell you really are a gamer and know how to speak to us in our terms, which is more than many game critics out there. I only have enough $$$ right now to get one and I was really on the fence between Evolve and Dying Light. I was concerned about the grind factor, but in reading your review, I’m gonna go with Evolve. Thanks, Crush! Submitted by Crush on February 25, 2015 - 12:46pm. Thanks! I hope you enjoy it. Other than PvZ: Garden Warfare, it’s the only multiplayer-only game to win me over. I think you’ll enjoy the dynamic strategy that Evolve introduces to the genre. Also, I appreciate your kind words! More reviews to come!